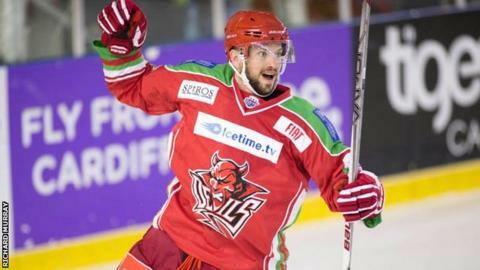 Joey Martin is staying at the Cardiff Devils for a third season after agreeing a new contract. The Ice Hockey Elite League's Player of the year has signed up for another year in Cardiff after a standout season. The 27-year-old Canadian forward scored 31 goals and 53 assists in 63 games to top the league's overall scoring table. "He is our top scorer, he is a total pro, he plays [when he is] hurt, he is an absolute warrior." said Devils player-manager Andrew Lord.